I'm going to pay for heart worm treatment and foster a pup from our local shelter. He's young and hard to adopt until he is clear (also large dogs are really hard to place) I hate to see him put down without a chance. 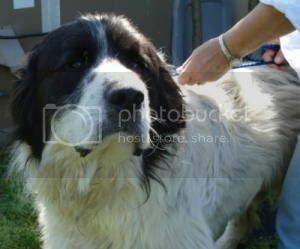 He is a Landseer Newfoundland pup. So does that mean he will live with you until someone adopts him? That would be so hard for me, I'd never let him go. But that's great you would/could do that. I didn't realize large dogs are hard to adopt out, but it makes sense. I just never thought about it. What a sweet face he has. I pick him up at the vet's on Monday. If I couldn't do this he would have been put down due to the length of time at the shelter and his heart worm pos. diagnosis. He was due to be put down Saturday and he really does deserve a chance to live with a family. 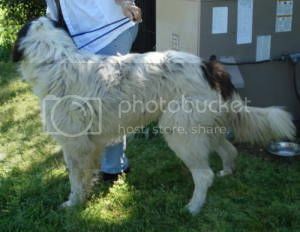 You know Nana the Peter Pan dog was a Landseer. He has lost over 20 lbs and cannot tolerate the kennel and shelter...he is a people dog. Bless you for what you do for our four legged friends. I have taken in so many that I can't take anymore (10). Well, at least I didn't think I could. I am fostering a basset hound that came up to our neighbors until I can get her spayed. The neighbor will take her, but has unaltered male dogs. I said I would pay for the spay because I know she would be going to a good home and I can't turn her over to a shelter and risk her being put down. You are a gal after my own heart. I have 4 dogs and 4 donkeys plus the feral cats. Don't forget about this sig line you requested! I noticed you are still using your old one. P.S. It's so nice you can help so many animals! I "think" I am ready for a new avatar. As I am keeping Mr. Jenkins most of the time now, and he is giving me such delight, I would like one of a white bishon. He is small in stature, wears a blue collar and is quite playful. I have no picture so I don't know if this is possible. If not, Nordie is still very good for me. Thanks for all the fans, they are keeping me cool. Trying to find a good image to work with, but there are so many differences in a Bichon Frisé, like size and age, curliness and fluffiness of the fur, coloring (even in white ones) and the trim and grooming of the fur coats. 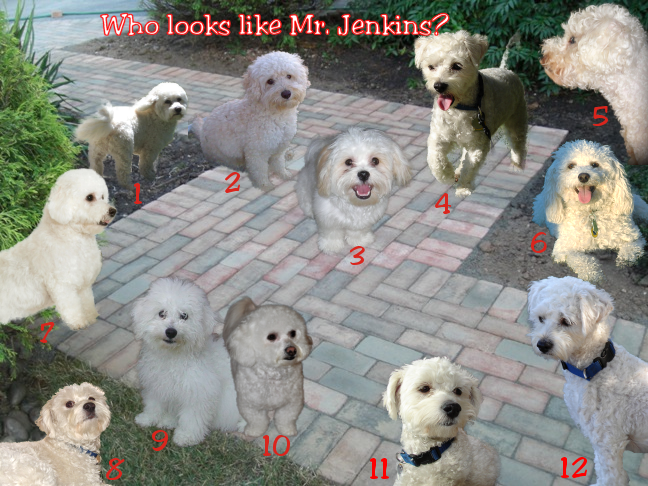 After I gather some sample images, I'll post them and let you decide which one captures Mr. Jenkins' looks and personality the best. I'll have something for you to change into after the Fourth! Thank you so much Brandi. He is pretty white, doesn't really have a rounded head when groomed, he has a long tail, is curly and just plain adorable. I searched all day for images of Bichon Frisés. I extracted them out of their pictures and put them on this background so you can tell me if any of them capture the essence of Mr. Jenkins. Let me know if we do, and which one it is, and I'll create an avatar for you. As you can see, within the same breed, there are many different looks! Oh Brandi you are so sweet to find all those pictures to find the right Mr. Jenkins. The answer is no. 12. His ears are perfect, around the eyes is perfect (it is cut short) and that stray hair over one eye is him. Hope you had a great Fourth of July. 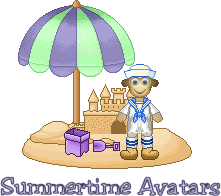 Here are the promised Mr. Jenkins avatars. The first ones are animated, and I took artistic license to use one different image of the same dog you said looked like Mr. Jenkins. He just looks like he is enjoying that boat ride! Brandi, they are so beautiful . . . but, alas, you read me like a book. Can you help me locate a summer signature for Connie. I guess I forgot to write it down. Bless you for all you do -- I come in here frequently to get a visual hug. I just went ahead and made you a new one that matches the colors in your new avatar. Brandi, thank you. You're such a dear! I remember you wanted a yellow rose once, so I also made these yellow if you'd like to use them sometime. I know it is not St. Patty's Day, but I have never posted this charming avatar, until today! Of course! A St. Patrick's Day avatar right after Fourth of July. Why didn't I know that was coming? Let me see if I can remember how to do this...I forget from one time to the next.